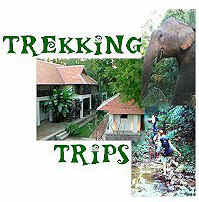 Our company has more than 20 years experience leading treks around Northern Thailand. We take small private groups so as to make minimum impact on the villages we visit. 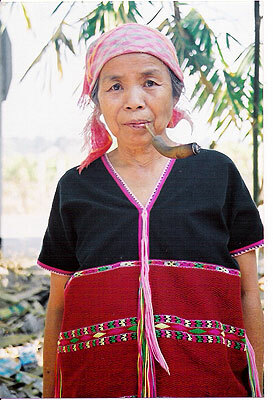 We teach you about Thai and hilltribe lifestyles and everything you see on the trip. There are trips for inexperienced and experienced hikers; families, couples and private groups. We are one of the few companies to organise all hiking treks for those who like walking. For a special experience see our Doi Inthanon Trekking Adventure a great trek to do between the months of October-March. Day 1 Drive out of Chiang Mai (approx 2 hrs.) , first stopping at the elephant camp for a 1hr elephant ride and some rafting. Drive on to a small rural town and stop for lunch. Then walk for 3½ hrs. to a Lahu & Karen village. This takes you through farming areas and then the hills that lead to the areas inhabited by the hilltribes. We spend the night here, in a Karen house. 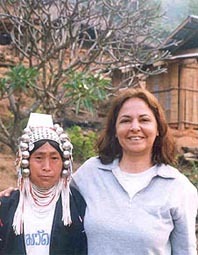 Highlights - elephant riding and rafting, visiting many kinds of hilltribes in a remote unvisited area. Trek Planner - Choose a trek according to number of days or activities. Take a break in Chiang Mai. Our trekking trips include treks, accommodation and tours in one complete package. Don't miss the Thai Cookery courses when in Chiang Mai- learn how to make your favourite dishes such as Green Curry, Pad Thai & Tom Yum Gung and many more. Click here for details of courses and prices.